Pasta is a fairly common Italian staple, but finding a restaurant in Singapore where each strand of tagliatelle or square of ravioli is lovingly handcrafted like the great rolling pin-wielding nonnas of Italy do is surpisingly difficult. That’s why Osteria Mozza at Marina Bay Sands is a gem. The 72-seater white table clothed space is the local offshoot of critically acclaimed Los Angeles restaurant by Nancy Silverton and Mario Batali that goes by the same name. Its menu showcases the best in flavours, ingredients and techniques of the Italian culinary canon — especially pastas. A guest is served the tagliatelle with oxtail ragu. 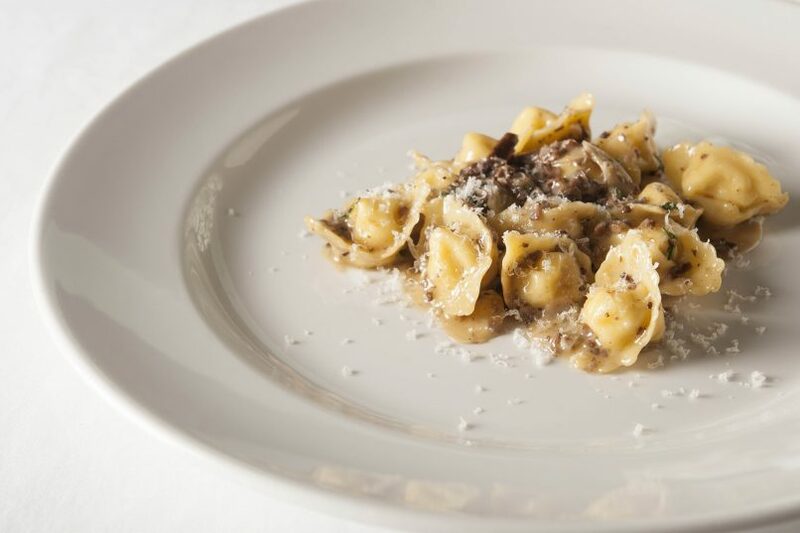 Some of the best, lipsmackingly delicious pasta dishes that he recommends include the celery root cappellacci, tagliatelle with oxtail ragu, garganelli with Bolognese and the orrechiette with fennel sausage. “They truly are classical Italian-style pastas in its shape and the pairing of sauces,” explains the chef. Osteria Mozza’s celery root cappellaci. While each plate that the restaurant presents looks effortlessly assembled, the dishes are the result of hours of work. Nothing less than artful perfection is served at every service, especially since each creation is intricately made. The cappellaci for instance is one of the most detailed pastas on the menu. The shapes are first cut out from a flat sheet of dough, then piped with a filling at precise amounts. This is then folded and shaped by hand – one piece at a time. Executive chef Peter Birks with his pasta team. The magic starts as early as 7am when the two-person pasta team clocks in and begin their labour of love. Flours are measured out and eggs are cracked to be transformed into that evening’s pasta dishes. Only quality ingredients flown in from Italy are used. Think along the lines of semolina flour from Abruzzo and 00 flour from Naples – both of which are key in crafting authentic dishes. Visit Osteria Mozza for more information.